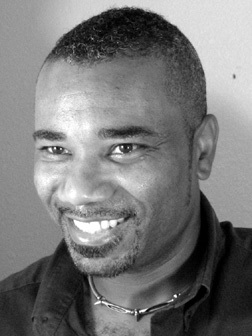 About ten years ago, I spoke on a panel at the Texas Book Festival. During a Q&A session, someone asked a question which resulted in an answer wherein I revealed a desire to write. But me? Write a book? For someone’s child? Not with my bad use of English and twisted grammar. No way. Days following that panel, I received an email from my friend, author Dianna Hutts Aston. She wanted to know if I’d ever heard of African-American “outsider” artist Bill Traylor. I hadn’t, so she mailed a newspaper article to me about the artist. The photograph of Bill intrigued me. 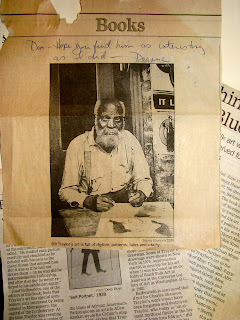 This well-worn, elderly Black man, sitting on a crate with a board laid across his lap, drawing pictures. I felt an immediate kindred spirit with this man. I wanted to give writing a try, but my confidence was low. “Maybe you could write the story, Dianna, and I’ll illustrate it.” I wanted to say. I pinned the article to a bulletin board above my drawing table where the photo of Bill seemed to stare me down, goading me to tell his story. I ignored Bill for several years. When I finally found the confidence to write I began with a graphic, I drew a timeline. At the beginning and end, I noted Bill’s birth and death dates. Then I plotted the events of his life based upon initial internet research. That’s where the challenges in telling Bill’s story began. Bill Traylor was born a slave. He was property, no different in the eyes of his owners than a horse or a plow. Slave owners didn’t always keep records of their human property, so dates of the events of Bill’s life varied from source to source. Frustrating. How was I going to write a nonfiction biography about a man whose birth date I couldn’t even confirm? I decided not to let that be an obstacle. I plotted the varying dates on the timeline, noting the source. I’d nail down exact dates later. The timeline proved a great visual tool. I could see Bill’s life laid out in front of me. But it also revealed more problems. I had way too much information to present in a children’s picture book. What to leave out, what to include? Should I include that he possibly worked as a flag man (whatever that was)? Should I include some of the more nefarious reasons given for his leaving the farm? And what about the 22 children he is said to have fathered over the course of his life? Should I include them, too? The timeline also revealed holes in Bill’s life. Much was written about the four years he spent drawing pictures on the sidewalk of Monroe Avenue in downtown Montgomery. But not much was known about the other 80 years of his life. That was a huge hole! Again I grew frustrated. But then I realized, all I had to do was study Bill’s art. His drawings serve as a visual journal of his life on the farm and on the streets of Montgomery. Bill’s drawings of dogs, snakes, cats, chickens and mules demonstrate his love of animals. Another drawing is of a lively-speaking preacher with arms outstretched toward worshipers gathered in a circle. A simple, yet powerful drawing that provides more detail about his life on the farm. Using Bill’s drawings as a guide, I began to put his story together. 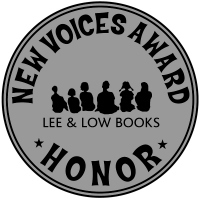 After several rewrites and about 29 revisions over the course of a summer, I submitted my manuscript to Lee & Low Books New Voices Award contest. I won the honor award. I was thrilled, but there was no contract offer at that time. It took two more years and several more rounds of revisions before It Jes' Happened: When Bill Traylor Started to Draw was acquired. My editor asked great questions that made me think beyond the chronological details of Bill’s life. She encouraged me to explore the question as to why Bill Traylor began to draw. She offered many suggestions, always leaving the final decision to me. One of the happiest moments of my career was when she acquired that manuscript. 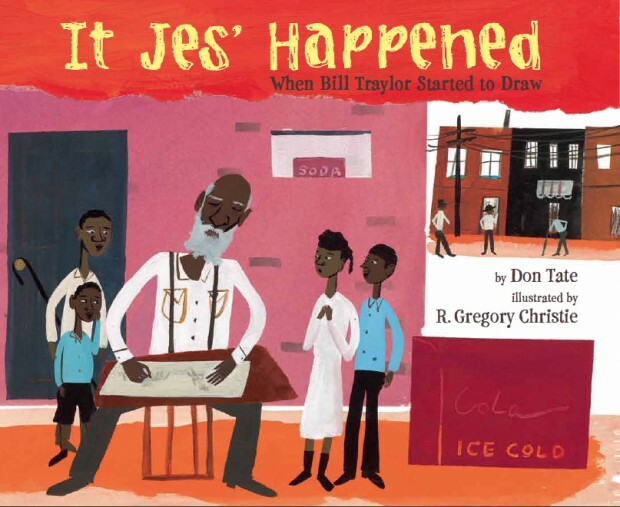 During school visits lately, I’ve been speaking a lot about It Jes' Happened: When Bill Traylor Started to Draw. The kids want to know why I didn’t illustrate the book and how it felt to have someone else illustrate the story. Great questions. The answer, however, would require a separate blog post. And, just so happens, I wrote one. Honestly, I love that R. Gregory Christie created the art for this book. I’m one of Greg’s biggest fans. Greg’s wonderful art is perfect for this project. When I look at the art for this book, I and can’t help but smile. Greg’s naive folk art style nods towards Bill Traylor’s own art style. And what author would complain about having a three-time Coretta Scott King award recipient illustrate their book? I love writing just as much as I love illustrating, and I’m currently working on several other books. I will illustrate some of them, but I have my fingers crossed for others I hope will consider illustrating my words. I’m versatile like that. For aspiring authors, my advice probably sounds cliché, but it’s true: Read a lot; write a lot; and revise, revise, revise. And pray. And grumble to your friends when you need to. Just don’t give up because it won’t happen overnight. As an author, mine was eight-year journey from conception to publication. Trekking Down the Jes' Happened Timeline by Debbie Gonzales from Simple Saturday. See activity guide and more guides by Debbie. 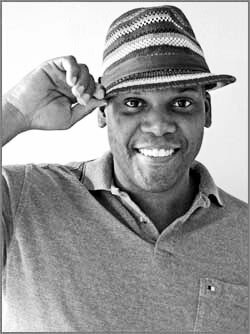 See also Jes' a Hit: an interview with Don Tate from The Brown Bookshelf: United in Story. Attention Central Texans! Don take will launch It Jes' Happened at noon April 9 at BookPeople in Austin. See more information! Note: Greg Leitich Smith will speak, in conjunction with Austin SCBWI, on "Digging Deep" at 10 a.m. that same day at BookPeople. Bill Traylor sounds like a fascinating person, and I loved reading the story of how this book came to be. I can't wait to read it! I just reserved it at my library. This is so interesting! Your research and filling in (or not) the gaps is a real inspiration for others who feel blocked when they can't find a fact. Great story; great book!